2019 is just the beginning of the celebration for Daniele Daminelli, virtuoso of colour and a successful association between the past and present! 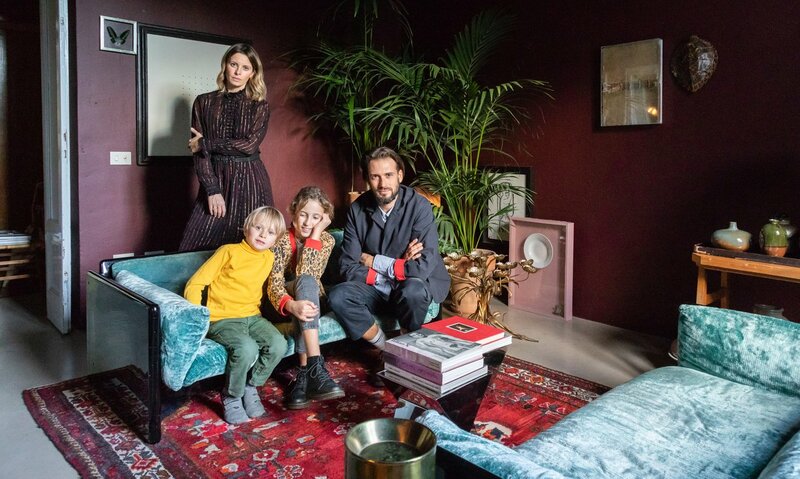 In the province of Milan, the former collaborator of Emiliano Salci and Britt Moran – the duo at the head of Dimore Studio, which he has been supporting for seven years – asserts his sharp and highly distinctive style. The founder of the newly established Studio2046 is writing his own story by acquiring a house in the ancient Treviglio area, and transforming himself into a romantic hero, a guiding light in his work. Like the principal protagonist in director Wong Kar-Wai’s film 2046, Daniele Daminelli likes to bring back memories from the past into a very present future. His own. The one we are visiting with his family and which happen to be a homage to Carlo Mollino. Daniele Daminelli admires the Italian architect’s sense of perpetual motion. His decor, consequently, has become a manifesto. An opera with a theatrical atmosphere in which his wife, Giulia, is a full-blown actress. Seduced by the extraordinary setting designed by her husband, the Italian finally let herself go when it came to putting it all together. 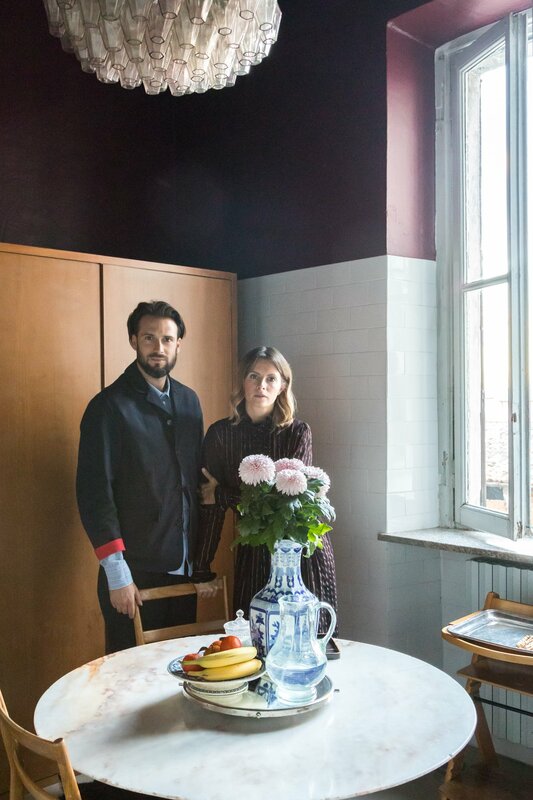 To avoid falling into the trap of the “nostalgic” aspect of patina – inseparable from the buildings of that era – the couple made a play on chromatic colours their primary choice. 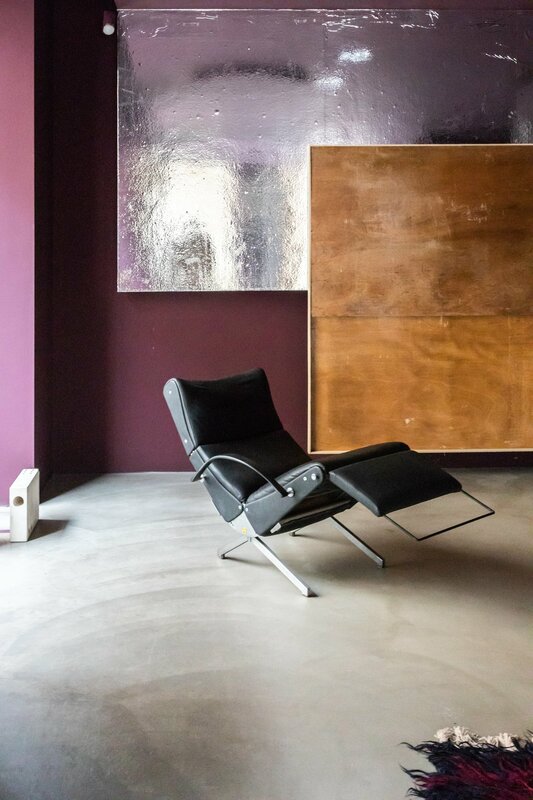 Aubergine, powder pink: the shades used on their walls refract and bounce back the light. To the point of creating an illusion of chiaroscuro worthy of Caravaggio, which is enhanced by a few more vivid and playful elements. Bright red bedspreads, detailing all in brass, iridescent blue velvet sofas by Simon Gavina… Always something to catch and delight the eye. 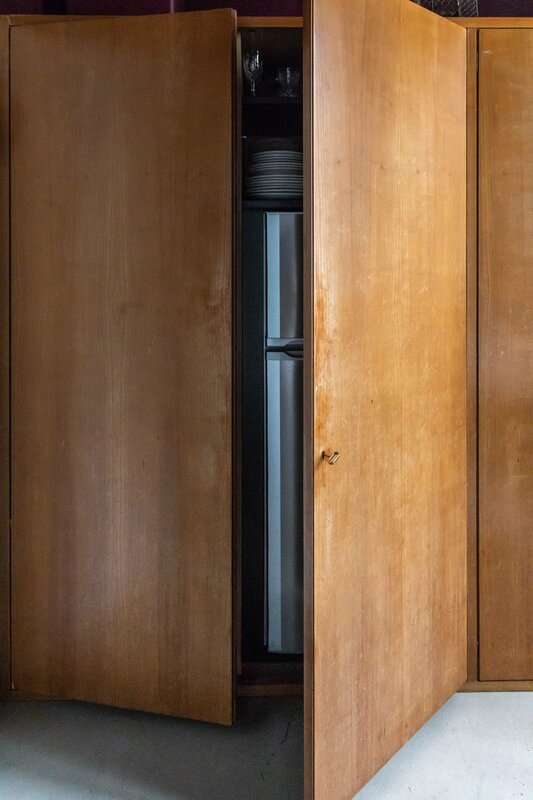 Especially when it comes to some of the masterpieces, with Gio Ponti, Carlo Scarpa and Ignazio Gardella in the forefront. Daniele Daminelli, anointed at Nilufar, is inexhaustible. Obsessive. During our visit, he will invite us to enter another part of his world: his gallery. A two-handed project with his friend and collaborator Alberto Zordan. Let yourself be swept away. Daniele, who are you? Can you tell us about yourself? I’m a young designer, specialising in interior design. I collect older designer pieces, which I attempt to combine with other, more contemporary pieces of my own design to create a new connection. For the galerie Nilufar, I created the concept of the Tavolo 01, Supermobile2046, which was presented at the last Salone del Mobile in 2018. I trained at the IED (Istituto Europeo di Design) in Milan, then trained for a further 6-and-a-half years at Dimore Studio. For the last year, I’ve been running my own company, Studio2046. Which period or personality inspires your work? The 1950s, and Carlo Mollino. What do you like most about interior design? What’s the first thing that you notice when you arrive somewhere? How do you make use of colour in a house? I like to combine different geometries to create a composition, and to combine and link the different colours that they represent. Where does your furniture come from? Dan Flavin and Walter De Maria. Could you tell us about your plans for the future? I have a number of different projects in the works, including the restoration of a 17th century villa in the hills of the Pavese region. It will be a joint project with Marta Celada, a top Milanese architect.